Bolognese is a family favourite. With this wholewheat option, you can ensure you are getting fibre into your diet, as well as protein from the chickpea and vegetable topping. Add some sprinkled parmesan on top if desired! 1. Heat up water for cooking the pasta in a large saucepan. When this is boiling, bring back to a lower heat and cook the pasta for 15-20 mins until tender. 2. While this cooks, heat up the olive oil in a pan and place the garlic, celery and red onion in and cook for 5 mins on a low-medium heat. 3. 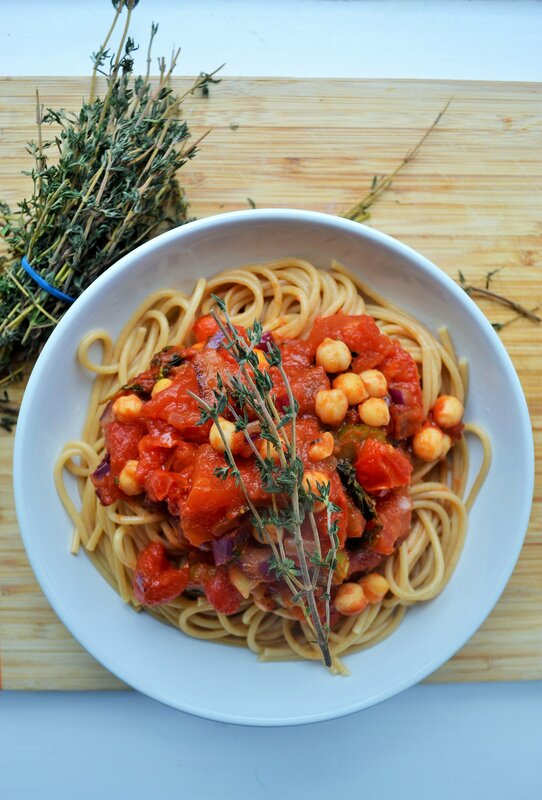 Place the thyme leaves into this pan and add the tinned tomato, fresh tomato, puree and chickpeas in. Allow to simmer with lid on for 10 mins at a low heat. 4. When the pasta is cooked, drain and serve. Spoon a large helping of the pasta sauce on top and eat hot.